GMA SHRM Compensation Survey – NOW OPEN – Participate today and save! View the 2017 Calendar of Events! Our 12th annual Human Capital Conference was held in May and we had another fantastic turnout of over 250 attendees. Cy Wakeman was our featured keynote speaker and we all left the conference with better ways to engage and how our staff accountable. All of these outstanding achievements would not have happened without the commitment and support of the GMA SHRM Board of Directors and volunteers who give countless hours and do so much for this chapter. I cannot thank each of you enough for the work you do. We also say farewell to Dawn Koopman, our current past president. I am thankful for the leadership she provided and she was a great sounding board! As our structure did go through some significant changes, I will be staying on as President for another term with Tammy Wacek, President-Elect by my side. We look forward to leading GMA in the coming year. If you haven’t already, please be sure to sign-up for the June PDS. I know it’s a busy time with school letting out and summer vacations, but we hope to see you there. Our annual member survey also will be coming out soon. It’s a shortened version – so please take 5-10 minutes to complete it. New this year – 5 survey participants will be randomly selected to win a $25 gift card! Also, we will be hosting Casino Night on August 17th. This will be a networking event, combined with member and volunteer recognition, door prizes, drinks and food! Come out and gamble with (fake) money, see your fellow GMA members and meet some new friends. I hope everyone enjoys the summer and is able to take some time off work to enjoy the weather! Two U.S. House members, Reps. Rodney Davis (R-Ill.) and Scott Peters (D-Calif.), recently introduced a bipartisan bill, H.R. 795 that would provide tax incentives to employers to help employees pay off their student loans. H.R. 795 would provide companies with a tax deduction for providing employees up to $5,250 per year to repay educational loans, and the money would be tax-free to employees. The deduction would be comparable to the tax benefit employers and employees currently receive for tuition reimbursement. Under current law, employer repayment of student loans is treated as additional compensation and is taxable as such to both employers and employees. According to a 2016 survey by the Society for Human Resource Management (SHRM), only 4% of all companies surveyed offered a student loan repayment program to their employees. This was 1% higher than the previous year, however, and it seems likely that the number of employers offering this benefit would significantly increase if H.R. 795 were passed. H. R. 795 has been referred to the House Ways and Means Committee. Although the ultimate fate of the bill is unclear at this time, we will keep you posted about any further developments. Before you read about all of the great speakers our Programming Committee is bringing to our members – consider attending a Programming Committee meeting! Meetings are open for anyone to “test out” the committee and see what it’s like before joining. The GMA SHRM Programming Committee is responsible for all program content organized for members throughout the year – committee members get to pick topics and speakers that they feel are relevant and enjoyable to the professional HR community here in Madison! This meeting will involve reviewing the member survey results from the Human Capital Conference to determine what topics the GMA SHRM members are interested in for future programming! Mark your calendars! 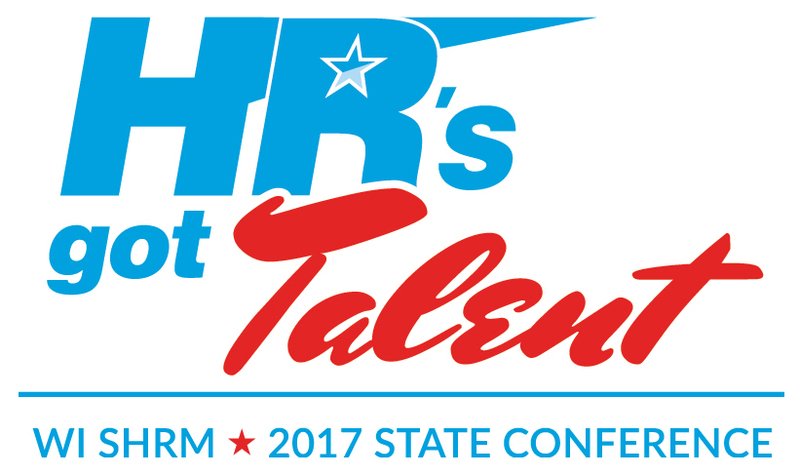 The premier Human Resources conference in Wisconsin is happening October 11 – 13, 2017. This year’s conference will take place at the family-friendly Kalahari resort in Wisconsin Dells. You can plan to attend for the same amazing benefits. Register early for the best rate! Registration opens June 2017! Visit the WI SHRM Conference page for more information. “I thought we made a decision about this, but here we are in the same meeting, deciding the same thing again two weeks later! Why? !” If you’ve ever thought this, you aren’t alone. Most of us have been part of teams or organizations where you feel like you simply spin your wheels and never move forward. A client called this week identifying this as one of her greatest frustrations with her team. She said she had something to bring to the team and she knew that if some of the group didn’t agree with the outcome, they’d just bring it up again at a later meeting. We talked about some of the things potentially causing this behavior. So why does this happen? The cause can be fairly simple, as can the fix. Most commonly, the team didn’t have enough healthy conflict around the idea to get buy-in. The conflict may not have happened because there were different communication and processing styles in the meeting. Some folks can think aloud. Others need space and time. In many cases, the internal processing folks thought about the decision after the meeting and came to a different conclusion. They then returned to the group with their decision, even though external processing folks in the group felt the decision had been made. An easy fix for this type of revisited decision is to provide an agenda with the relevant facts prior to the meeting and being clear about the purpose of the meeting. If the meeting is for information only, say that. If it’s to make a decision, say that in the agenda. This helps processors prepare for the onslaught of out loud thinking, giving them fair footing to contribute to the decision. If you are seeing passive aggressive behaviors when decisions are made, the root cause is often a damaged trust level in the group. Team members figure, “Why have conflict?” because they feel their contribution doesn’t matter anyway. When contributors feel they can’t impact the outcome, we see passive-aggressive behaviors that look like sabotage of previous decisions. These teams never get to the point of conflict because they don’t trust the intentions of the others enough to even engage in any conflict. Patrick Lencioni talks about this phenomenon in his work, The Five Cohesive Behaviors of a Team. As a certified Five Behaviors partner, I find teams need time and space to talk through what got them to the point of feeling as if all team members’ opinions aren’t heard. And while these conversations are difficult, again, the answer is often simple – they’ve never addressed a perception they have of the other folks on the team. Once we address team members’ misinterpretations vs. the intended behaviors, teams are ready to move forward, have healthy conflict and ultimately commit to action as a team, eliminating those frustrating repeat meetings. To learn more about the Five Behaviors of a Cohesive Team, join us at our June GMA-SHRM meeting where Sarah will walk us through the model and discuss ways to create a healthy, cohesive team, which then increases retention. Currently, the market is relatively slow and it is still more of a company driven market. Anyone remember 2008? It was a candidate’s market. If you took your “sweet time” hiring…even a candidate who was merely GOOD was gone by the time you made a decision. The size of the company does not matter. Candidates are not wowed by the big company name. Particularly the current generation. They are looking at opportunity…growth…flexibility…ability to make decisions…autonomy…challenge etc. In fact…they look at companies that can’t move things along and that seem to “drag their feet” in the hiring process as inflexible, indecisive and not having it “together”…in most cases they are viewed as either arrogant or inept by candidates! We have gone back to a candidate market in the next few years. In fact, we are already seeing it with high potential people. Unfortunately, many organizations have forgotten the lessons of the past and gone back to their old thought process. They have convinced themselves that they can take their “sweet time” when making a hiring decision. WRONG…if you start your hiring process and drag your feet…the best candidate will be gone. Why? Because everyone wants the best candidate! Smart companies recognize that fact and make decisions promptly and…as a result…steal the best candidate right out from under the noses of even big name companies that think they have an edge in the hiring process because of their size. Want to gain an edge in a candidate market…or for that matter in any market? Be decisive! You will find yourself beating out even the “biggest” and what people consider “the best” employers because in most cases…they are slow and indecisive. In this case the belief that “speed kills” is wrong…in fact companies with speed will be the ones that thrive in the candidate driven market that we will face in the future! Getting your HRCI or SHRM certification? Both organizations now have MOBILE APPS that you can download to help in your certification prep! Check out the App Store in your smart phone (iPhone or Android) for these helpful tools! In 2017, the SHRM Foundation will award almost $500,000 in support of students seeking undergraduate, graduate, certification and professional development opportunities. It would be great to see Wisconsin SHRM members be recognized as scholarship recipients! Scholarship funds may be used for any combination of test preparation expenses, such as SHRM Certification Preparation tools and/or exam fees. In addition to the SHRM Foundation Certification Scholarships, your WISHRM state council sponsors a Certification Scholarship in the amount of $750 for a SHRM national member who lives or works in Wisconsin and is preparing to sit for the SHRM-CP or SHRM-SCP certification exam. When applying for a SHRM certification scholarship, eligible applicants will be considered for both the Foundation and WI State Council sponsored scholarship. To apply go to the SHRM Foundation Scholarship page. The deadline for the Spring offering is coming up soon so make sure to get your application in. The WISHRM Certification Scholarship will be awarded in fall 2017. Sometimes you just have that question…..you would really just like to ask an HR colleague quickly. Perhaps it is limited to your field of work, or a specific situation. Let GMA SHRM help! In response to a specific need, we are excited to launch the “Idea Exchange” as part of your membership in GMA SHRM! The goal of the Idea Exchange is to provide a secure area for all GMA SHRM members to be able to start a dialogue and find someone to network with on a particular issue, and to share files in a more secure format - or at least share contact details so files could be shared. Once you are logged in, click on ‘File Library’ at the top right, and Idea Exchange will appear on the drop down menu. Interested in joining the Social Media & Technology Committee? Simply want to learn more about what we do? Join our next committee meeting via telephone conference! Contact Contact Tia Gibson (tia.gibson@covance.com) for details – all interested GMA SHRM members are welcome! Survey invitations are scheduled to go out in late April with participation opening on May 1. Watch for your invite to be delivered to your email inbox. If you did not receive one, go to http://www.gmashrm.org/GMASHRM_Surveys to request access to participate. Schedule some time to enter salary data for your company before June 16th. Close the door, grab a cup of coffee (or a beverage of choice), and complete the survey. Kick back and relax as you wait for Gallagher to compile the survey data. The results are expected to be available for purchase at the beginning of September. Purchase your survey report for just $300. That’s half off the non-participant price! The survey is not limited to GMA SHRM members. If you know of other organizations that would be interested in participating in the GMA SHRM Compensation Survey, please forward the information. All survey participants will receive the discounted price when purchasing the compensation survey. Survey Participation Deadline is June 16th! A tight job market in Dane County along with the lowest unemployment rate in the state has made finding talent more challenging than usual for Madison area employers. Offering a competitive wage is one of the best ways to maintain an edge in recruiting and retention, but to do that we need to know what other companies are offering their employees. That’s where the GMA SHRM Compensation Survey comes in. 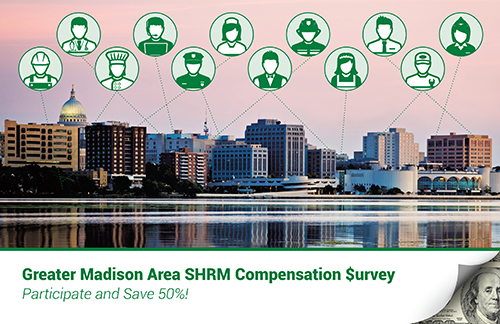 Specialized to local data, the GMA SHRM Compensation Survey is an invaluable resource when compared to other surveys on the market. But it’s only as good as the information it contains. That’s where you come in! The more organizations that participate, the stronger the survey data, and the better prepared you are to reach recruiting and retention goals for your company. Our survey is administered by Gallagher Surveys through their secure and user-friendly survey portal. Invitations to participate were sent out to members on May 1. If you did not receive one, go to http://www.gmashrm.org/GMASHRM_Surveys to request access to participate. Data is due June 16th. Survey participants will receive a 50% discount on the cost of survey results and you do not have to be a GMA SHRM member to participate or get the discount. WOW! Did you know the chapter was awarded a PLATINUM award by SHRM? This type of recognition deserves a follow-up. We know there are companies with GMA SHRM members that are doing AWESOME work in the areas of diversity, inclusion, and workflex. Let's get your organization and you recognized! Click here to learn more and complete your application. Deadline is July 7th. Awards are presented at the October WI State SHRM Conference. Interested in joining the Social Media & Technology Committee? Simply want to learn more about what we do? Join our next committee meeting via telephone conference. January Meeting TBD - Contact Tia Gibson at tia.gibson@covance.com for teleconference dial in info! Want to know what’s going on in HR for the other areas of Wisconsin? WI SHRM has a new blog, Forward HR. Click here to take a look. GMA SHRM offers two $750 scholarships to students who are enrolled full time in an HR related program. Students from any local school can apply and the applications are submitted during the fall of each year. This year’s Student scholarship winners are: Aaron Ganske, UW Madison and Claire Doyle, UW Madison. GMA SHRM offers one $1000 award to an HR professional who is looking to continue their professional development. Applications are accepted in the spring of each year and the application process is very easy – so we encourage you to all apply next year! This year’s professional scholarship winner is Lydia Ombogo. Lydia is pursuing her Masters of Science in HR, and will use the award to offset tuition costs or attend a SHRM National Conference - as it has always been her dream to attend one! We hope to see even more applications including those who were not selected, but were in the running for our professional scholarship next year! Get out your calendars and save these dates now for the 2017 GMA SHRM Programming and Networking Calendar! Click here to view the calendar! Identify and discuss trends in employee retention. Identify the key trust-building behaviors and skills that increase retention and engagement. Show ways to actively increase employee performance through healthy conflict and commitment. Recognize the need to have a cohesive recruitment strategy that has “selling” as a key component. Prepare you to advocate to senior leadership the business and community implications of not “selling” as part of your strategic talent recruitment process. Enhance your organizations image in the eyes of candidates and community to avoid turning off candidates and hurting your brand. You may not know that, in addition to local, state, & national chapters, SHRM also has its own foundation, made up of funds used towards scholarships for students and SHRM members, as well as research in the HR field, and more. See below for a brief description from the Executive Director of the SHRM Foundation! I am very excited to introduce you to the new SHRM Foundation—we have a new mission, vision and purpose, complete with a new logo and website! research-based HR solutions for challenging inclusion issues facing employees and potential employees. scholarships to educate and develop HR professionals and students to make change happen. opportunities for HR professionals to make a difference in their local communities.With this new strategy and vision we knew we needed to create a logo that would embody the three pillars of our mission. We also knew it was time to update our website, to provide SHRM members with an easy-to-navigate online space for finding scholarship information and new HR solutions and intiatives. Today, I am pleased to introduce the new shrmfoundation.org. We are grateful for the support we receive each year from SHRM members. It is our pleasure to serve and empower HR professionals and students. Please join us in 2017 as we take on the important work of creating inclusive workplaces. Where do you currently work? Johnson Block and Company, Inc. Which of your career accomplishments makes you proudest? The position I’m in didn’t have an HR person before. I’ve stepped in and built this department from the ground up. We still have a ways to go, but I’ve loved having the opportunity to piece it together on my own. What is the best advice you’ve ever received? “There is no such thing as failure. Failure is just life trying to move us in another direction.” This is unbelievably true, and it’s something I have to remind myself of frequently. Why did you decide to join GMA SHRM? I was advised to join by my first manager out of college. I was hesitant at first, but I’ve made so many great connections and friends through my membership. ﻿GMA SHRM welcomes the following members who joined our chapter in April 2017! Debby Ochoa, PHR Pacific Cycle, Inc.
Have you started with a new company? Has your organization recently promoted you to a new position? Or do you want to recognize a new person or promotion within your department? If so, we want to hear about it. Send us an e-mail, and we’ll publish your good news in the next HR InTouch! May 23, 2017 – Heather Becker, PHR, SHRM-CP has recently joined SVA has the firm’s new Human Resources Director. Heather is responsible for executing the HR strategy in support of the firm’s overall business plan and strategic direction. Heather consults with all levels of leadership on company change management, client consulting, HR policies and processes. Her experience includes employee relations, employment and compliance regulations, organizational strategy, performance management, compensation, and employee benefit programs and administration. If you are a member who is in between jobs, or who is currently employed but seeking new positions or career paths, write us a brief description of your skill set, areas of expertise, what you’re looking for, etc. Send us an e-mail. We’ll publish your information in the next HR InTouch. Do you have an interest in writing for the HR InTouch? We have an interest in learning more about your area of expertise! Why should you volunteer? Top three reasons: 1) to share your knowledge and experiences to educate others; 2) to become more connected in the HR and Dane County communities; and 3) to contribute towards the advancement of GMA SHRM and the HR profession. The first step is for you to choose a submission option: you can pre-submit an article to GMA SHRM at any time for us to use in any of the upcoming newsletters, you can sign up to write for a particular month, or we can put you on a list of people to contact in future months whenever we need articles. Because the HR InTouch is now in an online format, the size is flexible. The article should be engaging and hold readers’ attention. Include the core information in your article, and we will advise if it is too lengthy. GMA SHRM is conscious not to allow solicitation through the articles, in an effort to protect the interests of our partners and members. The nature of the article should be educational (i.e., what are the business advantages of having a product like yours) or informational. Otherwise, if you truly are interested in advertising through the HR InTouch, you can work with our Marketing Committee. As a rule of thumb for article writing, if the submission relates to a for-profit event, or specifically markets your company (vs. your industry), it is an advertisement, and should be purchased. If it is a not-for-profit event that your company is hosting, or an announcement (i.e., a SHRM member recently joined your company), it is an acceptable addition to the HR InTouch content. If you have any questions related to the appropriateness of your submission, please contact us. If you have questions, or to submit an article, contact GMA SHRM at chapteradmin@gmashrm.org . Greater Madison Area SHRM, Inc.